We heard about this game a couple weeks ago, and earlier today we saw it hit the iTunes App Store, and now it's time for Android users to get in on the fun. 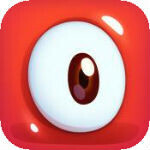 Pudding Monsters, the new puzzle game from Cut the Rope developer ZeptoLab is now live in the Google Play Store. The game describes itself as a physics puzzler where you are trying to save your pudding monster friend from the fridge owner. Swiping sticks monsters together, eventually becoming the Ultra Mega Monster. And, monsters will have different special powers, like leaving trails of goo to add "unique twists and turns in gameplay". But, as we mentioned before, that doesn't exactly explain anything. If you've played the game Quell or Quell Reflect, you'll have a better grasp on what to expect. Of course, you can always just give the free version of Pudding Monsters a try. There is also an HD version available for just 99 cents. It's a pretty cool game. It definitely feels like a ZeptoLab game, which is a good thing.